We have separated the Palettes into two main groups; being watercolour and multi-purpose. 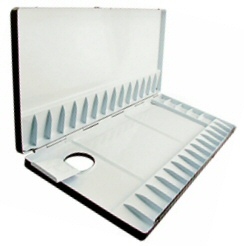 The multi-purpose palettes are generally used for oil and acrylic but are also often used by watercolour artists. For example the Mijello Atelier palette is often used as a very large watercolour palette.